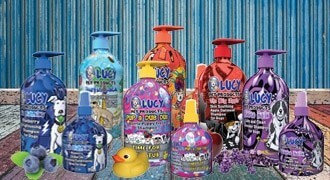 At Lucy Pet, we put as much love and care into our unique and colorful packaging as we do in the products themselves. We are serious about improving the lives of dogs and cats through innovative products with the latest advancements in health and well-being. We believe that every pet deserves the very best. Lucy Pet’s Formulas for Life ™ are made with high-quality ingredients are sourced globally from reputable suppliers we know and trust and have worked with for years. We do not source any ingredients from China. Our food formulas contain no duck by-products, no salmon by-products, no chicken by-products, no corn, wheat or soy, and no artificial preservatives, flavors or coloring. All our products, from food, litter and shampoos and conditioners are manufactured in American facilities, providing jobs for Americans. Surfin’ Jack and Ricky the Rescue Cat are our brand ambassadors; both were adopted from local shelters. With loyal followings on Facebook, Instagram, and Twitter, they’re on a mission to help shelter pets everywhere get a second chance. Surfin’ Jack’s fun-loving personality was the inspiration for the Surfin’ Jack Moisturizing Coconut Shampoo and Leave-In Conditioning Sprays. 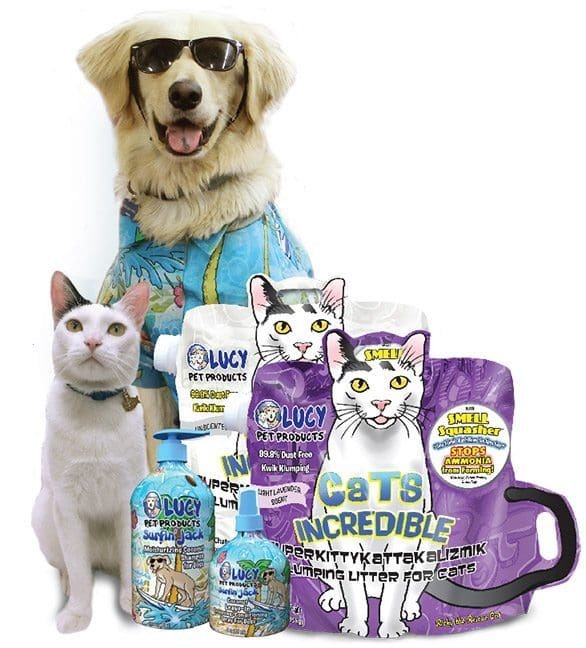 Jack is featured on the bag of our Lucy Pet Formulas for Life ™ and our Lucy Pet’s Surfin Jack grooming products. 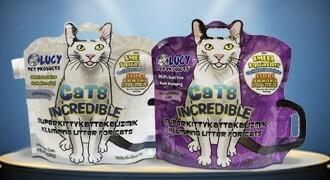 Ricky the Rescue Cat is featured on the bags for Cats Incredible™ Litter for Cats™ and our Lucy Pet Formulas for Life ™. Lucy is featured on the label of our “Berry Berry Smellicious” Shampoo and Leave-In Conditioning Spray. 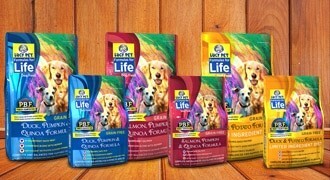 Dog and Cat foods with natural ingredients using new, advanced science with our exclusive P.B.F. Prebiotic Balanced Fiber for a healthy digestive system to feed the entire body in a truly unique way. For Cats: With patent-pending breakthrough technology that stops dangerous ammonia from forming in the litter box. Precisely pH formulated for advanced cleansing, nourishing and conditioning of the skin and coat. Members of the Lucy Pet sales team volunteer at the Lucy Pet Foundation mobile spay & neuter bus. 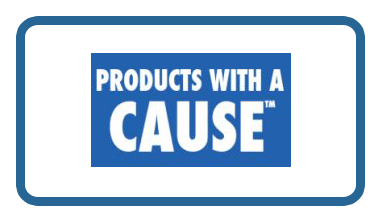 “Products With A Cause” means we are all committed to helping stop the 80,000 dogs and cats that are euthanized every week in our country. If you would like to volunteer at The Lucy Pet Foundation click here. Wherever possible we strive to reuse, recycle and reduce our impact on the environment. Our Grooming Products are made in a 100% solar-powered facility in California. Our Cats Incredible™ Litter for Cats is made in the USA and follows environmentally friendly procedures. We source ingredients globally from reputable suppliers we know and trust who follow sustainable practices, including responsible manufacturing practices. We do not source any ingredients from China. All of our product packagings is recyclable and non-pollutant, so please recycle when you can. All of our products are manufactured in American facilities, providing jobs for Americans. 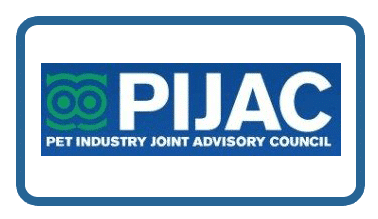 We know that consumers depend on their local pet specialty retailer to find innovative products, and advice to care for their pet. Lucy Pet is committed to supporting the pet specialty brick and mortar retail stores continue to thrive to be a trusted destination for pet parents. That’s why our products are available exclusively to pet specialty focused retailers. Since feeding my 9-year old Black Lab, Briley, the Salmon, Pumpkin & Quinoa product she has almost turned back into a puppy. She is now abundant with energy again and her coat of hair is so glowing and healthy looking. This food is fantastic and I'm so grateful to the entire LPP staff for their dedication to the health of animals. Seriously! I have been feeding my 15 year old chubby, gimpy, sweet couch potato pup for a few months. Rico has lost over 5 pounds and has a new spring in his step that is considerably noticeable. Both my dog washer and gardener have noticed the difference asking my if I changed his diet. Rico is lighter, spunkier and more energetic because of Lucy’s salmon and quinoa kibble. I'll travel great distances to get my hands on this litter. When I lived in a tiny camper and had to have the litter box right below my sleeping quarters, this litter saved my sanity. YOU CAN'T SMELL IT. It clumps soooo, so nicely. I used to think World's Best was the stuff to get.. Cat's Incredible puts it to shame. My black lab continually scratched. We tried changing her dog food & biscuits (dog treats). We also tried allergy medicine & fish pillls & nothing helped her. I went to Angels Pet World in Hudson,Wi. & someone was there passing out samples of Lucy Leave In Grooming/ Conditioner. Oh My God! I can't recommend this product enough. What a WONDERFUL Product. Thank you Thank You! 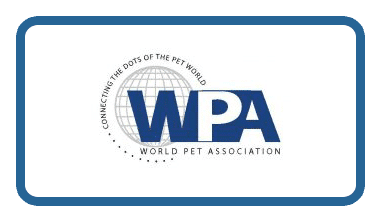 We are proud members of WPA World Pet Association.